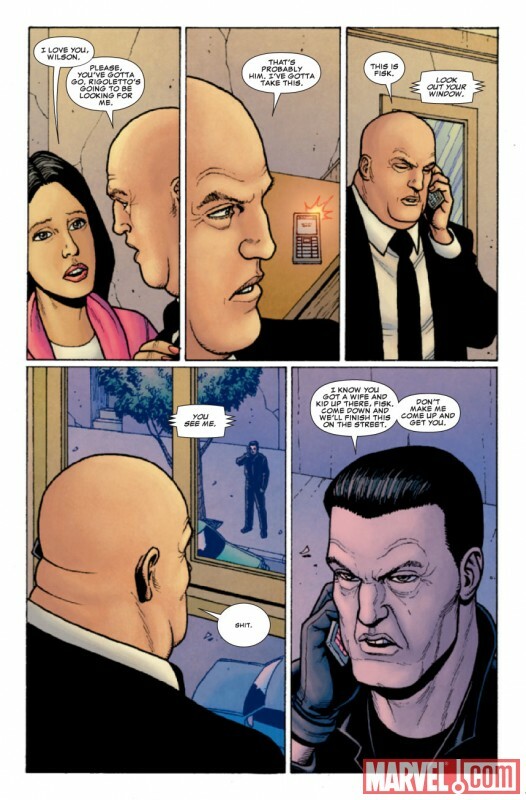 Flashback Friday: Maybe Frank Castle Just Needs A Hug--PunisherMax "Kingpin" and "Bullseye"
Frank Castle is not a happy man. Nor is he a peaceful one. 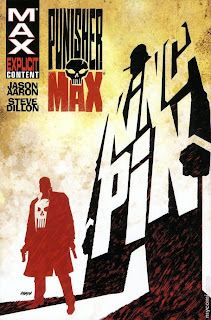 This series builds upon the superb Garth Ennis run of the Punisher in the Max Universe but the comic gets a new title and a new creative team in the form of Jason Aaron and Steven Dillon (a long-time Ennis collaborator, interestingly enough). What Jason Aaron does is bring in ideas from the "normal" Marvel Universe like the Kingpin Wilson Fisk or the crazy-talented but also crazy-insane Bullseye and Aaron makes them grounded in the reality of this much more, "real" world. 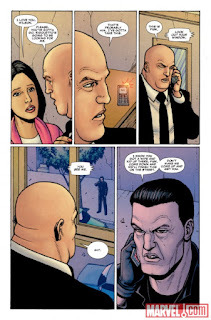 You would think it'd fail considering how hard Ennis worked to NOT do this during his run on the Punisher (with maybe the exception of having Nick Fury involved), but this actually turns out pretty well. 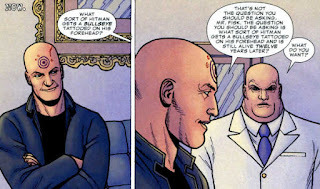 This comic seems to not really be split into arcs so much as telling one really long story that will be ending soon as the series wraps up (Marvel recently announced it was ending). Therefore, I can review the first two trades as just one entity as they are pieces of a story. What is that story? 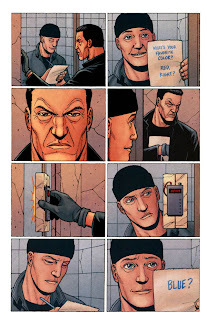 I'd argue that from what I've read and because I know what comes next (spoiler: the Punisher goes to prison) that this comic is basically tracing the downfall of Frank Castle both physically and emotionally. Notice how I said, "Frank Castle," and not, "The Punisher." 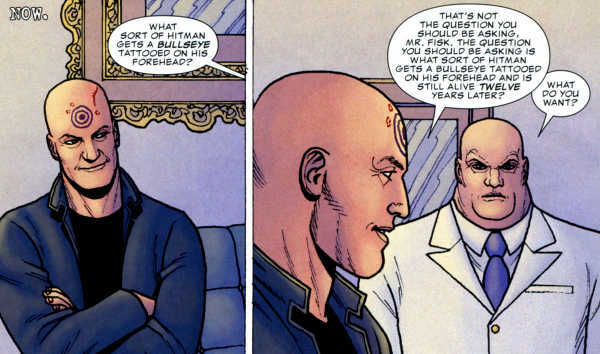 The reason for that is that Frank thinks of the Punisher as some unstoppable force, but over these two trades we see he isn't just the Punisher, he is a human being with weaknesses. 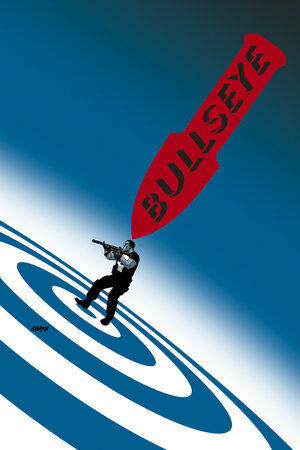 In the first trade he is decimated physically and by the end of the second Frank has lost some of the things that made him the Punisher--he's killed a cop (even if he was dirty) and something is said that clearly makes him question if this whole vendetta is really being done for his murdered wife and kids or if it's something else, something darker. Yes, the question is if Frank Castle had the Punisher born that day in the park when his family was murdered in front of his eyes, or if as the assassin Bullseye is seeming to figure out, the Punisher has been there in Frank just waiting for an excuse to come out. Whatever the case, by the end of these trades it's clear our main character has some soul-searching to do. I make this comic sound very serious, and it is at times, but there are also moments of really dark and absurd humor, and boy is this thing violent. There is a reason this is on the, "Max" label. Overall it is a pretty interesting story, and worth giving a look. Two "Important" Marvel Books I Read Recently.